The Lighthouse | Islamist Morsi Takes down the Egyptian Army? In a surprising move, and what seems to be a preemptive coup, Egypt’s new Islamist President (member of the jihadist Muslim Brotherhood) Muhammed Morsi has declared Field Marshal Tantawi and General Sami Hafez Anan, who led Egypt’s ruling military council (SCAF), “retired” along with other top Generals. Perhaps more importantly, he has cancelled the latest constitutional amendment (which gave the Army broader powers than the President), and replaced it with a new amendment, which actually grants the new President greater autocratic powers than those that Mubarak had previously held. So much for the “freedom protesters”. Interestingly, this comes in the wake of an Islamic attack in the Sinai-Gaza area which left 16 Egyptian security personnel dead and more wounded. As it stands, it APPEARS that this move was part of an agreement reached between Morsi and the leading Generals. That is far from certain, and it is mostly derived from the fact that both Generals were praised, thanked for their “patriotic” cooperation, given medals of honor, and declared henceforth Presidential advisers, a move which seems to point to immunity from prosecution and a peaceful retirement. …they believe they have bought themselves time… and have taken a crucial first step towards real power… and slowly infiltrate more branches of the State. The Army meanwhile they hope will weaken. The Generals are mostly of Mubarak’s generation, and with control of the budget and most legislation the civilian government they hope will slowly loosen the military’s grip on itself. Real power of course, almost always rests with the military as no mob could stand against tanks, and jet fighters. Therefore, real power rests with controlling the soldiers in the tanks and fighter jets…The Islamists will attempt to integrate more Islamist youth into the army and security services (they will no doubt begin by establishing a new or revamped Police force loyal only to the President and the Brotherhood), and attempt to slowly replace secular officers with their own. Changing the military’s doctrine taught to soldiers, and their enlightenment oaths will also be a target. This is precisely what Morsi has apparently began to do. As will be discussed shortly however, certain events drastically sped this process up. The first Generals were replaced last week in the wake of the attack in Sinai, and today the very top of the military council was sacked. The army of course, has an entirely opposite set of goals…When recent polls turned against them, they quickly stripped the new office of any real power. This way, the army is seen to have allowed civilian rule and free elections, but has maintained its reign. It is hard to see how that can last;… In any event, the Generals have no interest in allowing the Islamists to start a war (against Israel) that they will have to fight and lose. The courts already seem to be aligning themselves with the Brotherhood. Reuters is reporting that just hours ago, a court struck down the military’s right to detain civilians. We will see how Tantawi reacts to this. Field Marshal Tantawi, veteran of the Yom Kippur War and head of Egypt’s ruling military council (SCAF), was sacked earlier today by Muslim Brotherhood leader and new Egyptian President Morsi. Last Sunday, in an audacious and complex attack, terrorists from Gaza together jihadists in Sinai attacked an Egyptian army (or paramilitary) base where at least 15 Egyptian soldiers/border guards were killed. Two armored personnel carriers were commandeered and headed towards the Israeli border to likely attempt a large scale terrorist attack. The IDF quickly foiled those plans, destroying the attacking force and killing several terrorists. The Egyptian military of course emerged the biggest loser of this scenario, by not only sustaining such a large casualty count in the attack, but also being compared to the IDF which quickly destroyed the same force (now even more heavily armed after seizing the base) without difficulty or losses. Morsi, taking quick advantage of this, called for the resignation of several key Generals, including the head of the Directorate of Intelligence, and the governor of norther Sinai. With the strength of the events on his back, the shakeup was carried out, despite the fact that the new constitution forbids the President from making military appointments. With that round having been successful, and the “taboo” of challenging and even firing Generals broken, a week later Morsi and the Muslim Brotherhood have gone straight for the jugular. The question of course is if this was a masterfully executed setup by the Brotherhood, intelligent manipulation of events that occurred, or neither. One scenario is pretty much as has been stated above. Morsi and the Brotherhood simply took advantage of the military’s weak performance in Sinai, pushed their luck, and surprised that the Generals balked, simply kept going. Another possibility is an involved set up. IF any group is capable of such feat, it is the Muslim Brotherhood in Egypt. This is the group that murdered Anwar al-Sadat, the group that survived decades of war against the Egyptian military, and now despite all the surprised leftist pundits who praised the “Arab Spring” to no end, the group that (as I predicted) emerged victorious in the recent elections. Weather by popularity or election fraud, either way it is a testament to their organization and powerful infrastructure in Egypt. The notorious al-Qaeda, at least during its heyday up to 9-11, is really nothing more than the Brotherhood with additional funding by Bin Laden. It is Dr. Ayman al-Zawahiri who formed the terrorist backbone of Al-Qeada. Long known as Bin Laden’s second in command (and since his demise, the leader of Al-Qaeda), as a leader in the Egyptian Islamic Jihad and Muslim Brotherhood, it was he who had the decades of infrastructure and experience in global terrorism while Bin Laden was likely no more than wealthy financier, and a charismatic and poetic addition to the PR campaign. Under Zawahiri, Egyptian led Jihadists murdered Rabbi Kahane in New York City, fired automatic weapons at a van carrying Hasidic students in the Brooklyn Bridge, conducted the 1993 World Trade Center bombing, and of course the same figures eventually succeeded in executing the 9-11 attacks. While the more international “Al-Qaeda” branch has been weakened by a decade-long relentless US campaign against them, the Egyptian base of the Brotherhood has never been healthier or stronger. Ironically, it even finds the US and the West strong supporters as part of the “Arab Spring”. Newly elected Muslim Brotherhood candidate Mohammed Morsi (now Egyptian President), flanked by the two powerful military chiefs he sacked earlier today in what seemed to be a Islamist coup against the secular armed forces. The Egyptian led Jihadist movement, which has carried out some of the most spectacular terrorist acts in modern history, and whose Gaza “branches” Hamas and (also) Islamic Jihad, wrested control of Gaza from the US supported and Fatah led Palestinian Authority, and who deftly stayed in the sidelines during the media’s darling Arab Spring protests, only to then emerge and mobilize mass resources (legal and illegal) to secure Egypt’s first post-Mubarak government, is certainly the one group who is capable of complex operations and manipulation of both the “Arab Street” and the Western media. President Morsi found himself President of a civilian puppet government. He controlled the Egyptian parliament, and had the office of the president, which had been stripped of any real power by the military’s constitutional amendment. What he did control however, was the Muslim Brotherhood’s vast domestic and international terrorist network. Using this influence, could he have organized, together with Hamas, the attack on the Egyptian position in the Sinai? Though violence between Islamists and the military in Sinai does occur, it is never on this scale and almost always initiated by the army. The Islamists and the lawless Bedouin tribes in Sinai are interested in smuggling, money and attacks on Israel. When Egyptian security forces have gotten in the way of any of these, there has been smaller scales violent episodes. Egypt has sometimes, attempted to stop terror attacks against Israel, international tourists in Sinai resorts, or to close smuggling routes and tunnels. However, an attack of this scale on an Egyptian military base is virtually unheard of. No one in the area could be very interested in the military response such an attack would surely cause. Smuggling, and attacking Israel is one thing, activities tolerated on some level by Egypt as it gives it influence over Hamas affairs, and a strong bargaining position over Israel. Large scale attacks on Egyptian military forces is quite another. Interestingly, after this unusual attack on Egyptian forces , the terrorists did change directions and intended to attack Israel in what they hoped would be a mass casualty terrorist attack. If the Egyptian government was behind this, it certainly starts to fit the picture. 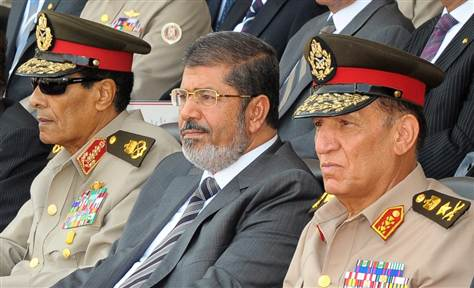 Morsi required the military to sustain a blow to lower its prestige, and give him the excuse to sack Generals. This precedent would establish his dominance over the army. At the same time, the Islamists reputation with a successful attack against Israel would improve their reputation and overshadow any negative reaction due to an operation that targets fellow Muslims. The secular army would seem weak, and the Jihadist forces strong. Furthermore, increasing instability of the Sinai Peninsula is what the Brotherhood is looking for. It can only encourage two responses; for Israel to be forced to take action on the Peninsula to defend itself, in which case Egypt will be pushed into confrontation with Israel with the rest of the Arab world in support, or for the (unfortunately) more likely scenario where Israel requests Egyptian aid in controlling the Sinai and allows an ever larger military presence there. Either case Morsi believes, basically shreds the Camp David Accords, and places Egypt in firm control over the Sinai and the gates of Gaza (which will certainly be their next target of acquisition). If the IDF has anything to say about it, the Sinai might end up in quite different hands, but that is another topic and dependent on the valor and intelligence of Israel’s Prime Minister. A picture starts emerging where Morsi could have engineered an attack on his own troops. An interesting clue lies with the men he replaced the Generals with. 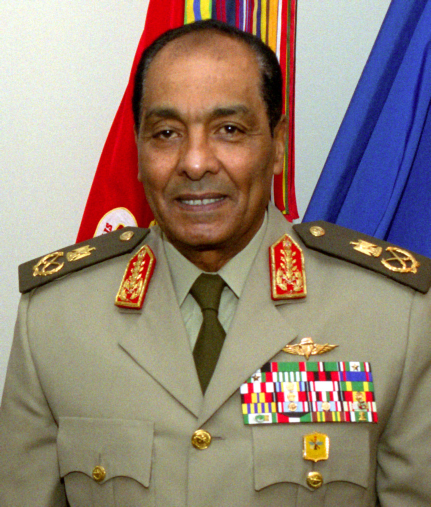 Field Marshal Tantawi, serving as Minister of Defence and head of the SCAF was replaced by the young General el-Sissi. The SCAF’s youngest member was General Abdel-Fattah el-Sissi. He was quite different from the other older members of the council, as most of them were veterans of Egypt’s wars with Israel, Yemen and Libya. President Morsi appointed one of the youngest and most religious top Egyptian Generals as the new Minister of Defense replacing Field Marshal Tantawi. el-Sissi has no combat experience, and most interestingly, is said to be a “religious man” and even accused of being a covert Muslim Brotherhood sympathizer. Little is known about him, except that he made headlines early on during the SCAF’s reign when he told British media that the army had conducted “virginity tests” to prove allegations of sexual abuse by its soldiers false. This statement embarrassed the military council. 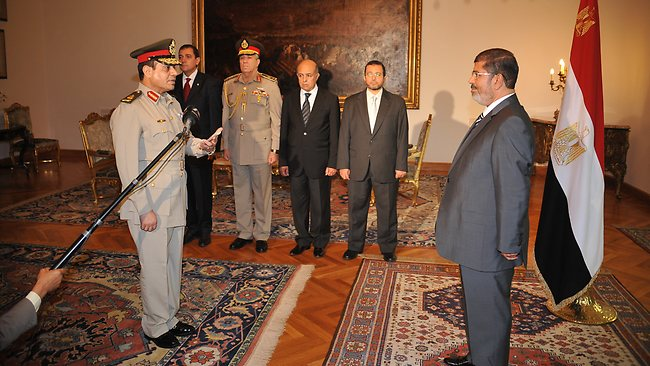 el-Sissi held the post of chief of Intelligence prior to his promotion today. Head of intelligence and a likely Islamist sympathizer, certainly the right kind of tools needed to engineer the attack and preemptive coup that took place. As head of the military council, el-Sissi was privy to everything the army was doing, and as head of Intelligence, in a perfect position to negotiate operations with the Islamic groups. Together with Morsi, they were in the perfect position to spring this trap. If this is the case, as intelligent as the move was, we can expect it will not continue to go smoothly. The rest of the Generals (if not the elder Tantawi) will react harshly to being usurped by a younger lower ranking officer who apparently was a mole. The army and the Egyptian middle and upper class, will see their country is being pushed off the cliff of war with Israel in order to appease Jihadist ambitions, and they will not jump off willingly. In such a situation, the US’s position will be extremely important. Egypt is dependent on foreign aid, especially in food. The West holds a lot of power over Egyptian affairs because of this. Unfortunately we can expect Obama to back Morsi against the army regardless of circumstances. On the other hand, in the absence of a planned setup, it is possible that the Sinani attack simply did in fact weaken the military’s position, and convinced Tantawi to opt out. Morsi, from a now stronger position, simply hammered out an agreement with the military. Tantawi, now in his 70’s was given an honorable way out, “promised” immunity from prosecution and Morsi had to choose a successor from the Council itself. It remains to be see if the promise will hold up to the inevitable calls for his trial. It may be that Morsi simply chose el-Sissi thinking it was the safest choice. As a religious man, as the most distant from the Mubarak regime, and as the youngest and least senior, Morsi may simply believe he would be the easiest to control. The downgrade from Field Marshal to Lt. General is rather wide. From the military’s perspective, they may simply be passing the torch to continue the conflict; by giving the elder Generals an honorable way out, and letting younger ones continue the struggle against the Brotherhood. 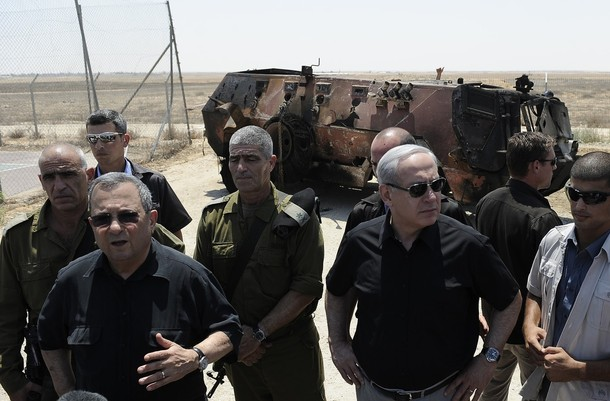 Along with top IDF officers and Minister of Defense Ehud Barak, PM Benjamin Netanyahu inspected the site of the thwarted terror attack from Sinai. In the background are the charred remains of the Egyptian APC used by the attackers. The first test of the coup will be the court’s reactions. Up to this point, the courts have largely remained pro-military and anti-Brotherhood. According to the current constitution, Morsi’s moves are illegal, especially since the current amendment had been upheld by the courts. If the courts stand firm against Morsi, they will give the army legal justification to move against him. However, they are very likely to have been intimidated by now, unsure of the military’s backing or real power, and they may instead declare that the original SCAF’s constitutional amendment was illegal, and so Morsi’s cancellation of it acceptable. At this point, it is still hard to tell, but what I believe is clear, is that Morsi had a deep understanding with at least one of the two main players. Either an agreement with Tantawi and Enan, which simply continues an uneasy truce with new faces and allows the older ones to retire, or an agreement with the religious head of Intelligence General el-Sissi in which together they scored a powerful surprise coup against the military establishment. This was all possible in either event, by either the planned or opportune Sinai terror attack of last week. Along with Tantawy and Enan, the heads of the Air Force and Navy were sacked as well, so the coming days will prove crucial to see if the military has any effective answer against Morsi’s coup, or it will quietly settle down into complacency and accept Islamic rule. In that case, the Islamists will have a tool they have never had; instead of homemade bombs, rockets and suicide bombers, they will the have the largest Arab nation’s US supplied Armed forces at their disposal to hurl at the IDF. That would be most regrettable along with the loss of life it entails, it would also have been completely avoidable with more intelligent Western leadership; but after all is said and done, Morsi and the Jihadists will find their new tool crushed, and perhaps red barrettes and red boots at the Suez’s banks once more… hopefully never to retreat again unilaterally for a THIRD time. One Response to Islamist Morsi Takes down the Egyptian Army?